I've been trying darn hard to keep up with the whole recent Fundamentalist Church of Christ of Latter Day Saints (FLDS) Texas-polygamist–temple-raid. I do want to know about it, get it, have opinions about it. Having recently moved across the country and getting settled in a new state and culture, though, I have been able to keep only the most superficial of intellectual notes on about anything that doesn't have to do with breaking down boxes, philosophizing over paint swatches, birth certificates, insurance cards, road navigation, etc. I would normally be fairly obsessing over the entire drama, I'm certain. It's right up my alley of interest; weird cultural Mormon-related and cultish stuff, big gender dynamics, complex issues involving freedoms, crime. Also, right before the raid, there seemed to be a little personal serendipitous flurry of polygamy-related ideas: a friend of mine ventured to the border town of Colorado City, AZ—the now-pretty-deserted former mecca of the Warren Jeffs camp--and took a bunch of pictures, I saw an episode of Oprah in which a former member recounted her compelling story, and I had a long conversation with a friend of mine who is filming a documentary about the so-called ‘lost boys' of polygamy. During this flurry, while helping my son with Keats's poem Ode on a Grecian Urn, I noticed some parallels. In this poem there are young, yet-unravished brides, a leaf-fringed legend, gods and men, a struggle to escape, a sacrificial heifer, and a little mountainside town silent and emptied of its flock. It's a stretch, I know, and I don't mean to make too much of it; the real epiphanic connector here for me were the last lines: "Beauty is truth, truth beauty.—that is all/Ye know on earth, and all ye need to know." Yes, that was it—some kind of vague key—Beauty, capital B and all. The entirety of the FLDS culture seems to be lacking that mainstay always valued within religion, probably within all culture. I'm no anthropologist, but I cannot think of a religion, culture, cult, significant group, etc. 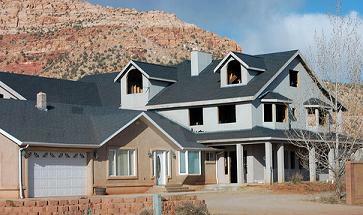 that is as apparently unconcerned with aesthetics as the FLDS seem to be. * How might such a disregard and apparent contempt for Beauty affect a people? I'm not exactly sure, but I know it must. Let me make it clear I'm not talking about the womens' notorious "1800's dresses" as Oprah referred to them. (Although I do want to talk about those dresses.) Viewing my friend's photographs of Colorado City: the shopping centers, stores, homes, landscaping (or lack thereof) even the cemeteries,--it's clear visual niceties are not a priority. I stated earlier that the FLDS culture lacks Beauty, but there is not simply an absence of such—there's a lot of downright ugliness in its place. It would seem that the structures of the FLDS are slapped together blindly with pot metal and particle board. Many of the monster homes are mishmashed together in a most abominable manner—one fully formed mammoth structure hooked flush against another. There's something even vaguely obscene about it. The buildings look violated. Even the newly built temple in Texas is about as ornate and fancy as a box of anemic, store-brand saltines. There is an overall feeling of fatal homogeny, a dilution of human passion and soul as watery as their old desert is dry. A sense of depression is rather unmistakable. All this may seem somewhat superficial of me. I admit superficial has been my lens on the larger world the last couple weeks. However, signs and signals are important in uncovering deeper meaning. Also interesting is that, taken as a whole, these "plain" and "conservative" aesthetics of the FLDS actually quite ironically merge into their opposite—eccentricity. I'm convinced more than ever that a total absence of style (for better or worse) is an impossibility. Now, about those 1800's dresses. As the FLDS drama unfolds, articles and comments are inevitably popping up about this mode of feminine dress. It's easy and obvious to assign "old fashioned" to the style, but it's much more complex. There's a reflexivity in it that relates to mainstream historical and contemporary Mormonism itself. Where an outsider like Oprah (correctly) sees a strange and inexplicable fashion remnant of the nineteenth century, a Mormon, Utahn, or other close observer sees it more specifically as "pioneer" gear. Mormon identity is, and will probably forever be, inextricably tied and bound to the pioneer experience. The Pioneer archetype is arguably Mormonism's inner child, complete with immaturity, pain, trauma, a journey, growth and triumph. 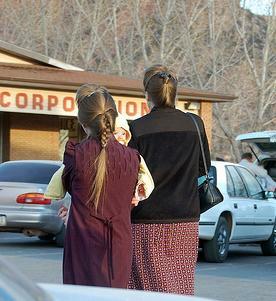 The outlines of the FLDS women's hairstyle, and dress are only exaggerations of fairly stereotypical Mormon feminine fashion. In an article at KSL.com, former FLDS member Joni Holm explains the top-heavy hairstyle, albeit a bit tongue-in-cheek: "It looks like a goose thing on top of their heads, the higher they can get that, the more righteous they are, so that's a trademark for them. They really are proud of that." It's not so popular now, but a version of this same hair was quite popular in 1990s Utah. I remember it being nicknamed "bangs to Heaven." Big hair in general seems to be somewhat of a Mormon feminine style, and I defy anyone to rummage through the thriftstore dresses racks in Utah and not find a healthy smattering of modern pioneerish dresses. Those are not castoffs from sisterwives. I remember what an oddity it was to me first moving to Utah and taking in the cultural quirks—"Pioneer Day" being one of the quirkiest. The masses would gather in downtown Salt Lake City, whole families dressed like pioneers sleeping overnight to watch the annual Days of '47 Parade the following morning. These were not my people. But as I continued on and grew in Utah, I began to understand. Those people are pioneers. Even the Jack Mormons, the excommunicated, the disaffected, the unlikely; even those Fundamentalist Mormons are pioneers, every last one of them. So, it's not so surprising that a fundamentalist offshoot cult would adopt the accoutrements of such a culturally powerful and meaningful central figure. The Pioneer itself is very fundamental. The real surprise about the FLDS lies elsewhere, and deeper, I suppose. Within a fundamentalist clan such as this, there is a necessary isolation, a rejection of change, transformation, etc., that probably leads to the kind of sick social festerings and abuses uncovered so far. And apparently really ugly buildings. *One might say the Amish? The Shakers? I would argue that the lack of unnatural and uneccesary adornments in these cases actually serve to celebrate natural beauty, and that the end result is not visually displeasing.